Junior Boiler Vet Camp participants with their veterinary student counselors, Dean Willie Reed, and Dr. Jim Weisman. Purdue Veterinary Medicine welcomed 100 campers in June for the annual Boiler Vet Camp (BVC). The only camp of its kind in Indiana, BVC gives junior and senior high schoolers a glimpse of the many fields of veterinary medicine through an immersive in-residence experience. Aspiring 8th and 9th graders took part in the 10th annual Junior Camp June 11-17 with a week of hands-on learning sessions including: "Welcome to the Blood Bank," "Dissecting to the Heart of It," "Cud It Out," "After They're Gone," "Poultry Potpourri," "A Look Inside the Horse," "From Our Farm to Yours," and "Fish Need Doctors Too," showing the many important roles veterinarians and veterinary technicians play in animal healthcare. Campers also took a behind the scenes tour of the Indianapolis Zoo; participated in an interactive session on regulatory veterinary medicine titled, "The Amazing Trace," with the Indiana Board of Animal Health; and enjoyed a field trip to Fair Oaks where they visited the Dairy Farm and Pig Adventure. Campers capped off the busy week with team presentations shared with their families, fellow campers, and counselors during the closing ceremony titled "Follow the Clues," in which each team worked through a real case to determine the appropriate treatment. 2017 Senior Boiler Vet Camp participants with their veterinary student counselors as well as Dr. Jim Weisman, and Associate Dean for Academic Affairs Kathy Salisbury. Without skipping a beat, Purdue Veterinary Medicine's Boiler Vet Camp team then hosted the senior campers who checked-in Sunday, June 18, for a "pawsitively" awesome week all about dogs. The 8th annual Senior Boiler Vet Camp was open to high school students in grades 10-12. Campers learned about the veterinarian's and veterinary technician's role in the wellness care of shelter animals and preparation of dogs for adoption. Groups of campers teamed-up to care for ten dogs from the Clinton County Humane Society and the Kokomo Humane Society, learning about the various aspects of wellness care required for their camp dogs. Additionally, the campers learned dog behavior and training techniques, performed physical exams, practiced life-saving skills, and learned about diagnostic blood work and the art of surgery. Senior campers also learned the ins-and-outs of running a large-scale animal shelter through a visit to the Humane Society of St. Joseph County in South Bend, Ind. The campers met with Dr. Carol Ecker (PU DVM '64), Purdue Veterinary Medicine alumna and medical director of the humane society, and her veterinary team, to learn about their roles in working with pets at a large animal shelter and the veterinary care animals receive in preparation for them finding new homes. The 50 senior Boiler Vet Camp participants showcased all they had learned throughout the week by giving a special presentation during the closing ceremony on Saturday, June 24. This year, six of the 10 camp dogs found forever homes with camper families and even one DVM Class of 2019 student! That's a record number for camp dog adoptions. Dr. Jim Weisman (PU DVM '97), director of Student Services and PVM clinical associate professor, noted, "The PVM family comes together annually to provide this excellent and unique experience for these future veterinarians and veterinary technicians. Each year the feedback from both the campers and their families is overwhelmingly positive," he said. "I would like to thank everyone who helps to ensure that our camps continue to be a great success." Wearing blue smocks, BVC junior campers spend time learning about poultry during a session led by Dr. Pat Wakenell, professor of avian diagnostics in the Department of Comparative Pathobiology and avian diagnostic pathologist with the Animal Disease Diagnostic Laboratory (ADDL). 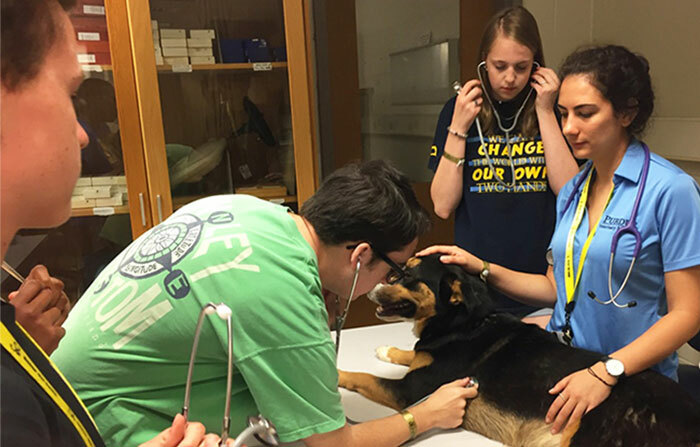 Alexis Arenal, of the DVM Class of 2020, helps senior campers as they learn the basics of canine physical exams with “Clint,” one of 10 camp dogs.